INCREASING demand and spending cuts are impacting on ambulance response times in Northern Ireland, with new figures also revealing 34 incidents where patients whose lives were at immediate risk waited for at least an hour. The longest delays for emergency care are among the key findings of an investigation by The Detail into ambulance response times based on extensive data relating to hundreds of thousands of 999 calls. Our research also uncovered a patient with “traumatic injuries” who waited one hour 18 minutes for an ambulance in Lisburn and another with an injury in the category of “stab/ gunshot/ penetrating trauma” waiting one hour one minute in the Magherafelt area. Our analysis has confirmed a wide variation in ambulance response times across Northern Ireland – both by postcode area and health trust. See interactive map above. And while we also reveal new figures for attacks on ambulance crews, the head of the Northern Ireland Ambulance Service (NIAS) cited rising demand and reduced funding for the drop in response times from 71% of Category A calls responded to in less than 8 minutes during 2010/2011 to 69% in the years 2012/2013. The current Northern Ireland target is that an average of 72.5% of all Category A calls should be responded to within 8 minutes. These are the calls where a patient’s condition is judged to be immediately life-threatening. Health Minister Edwin Poots said he was “disappointed” that Category A response times had dropped but noted that the ambulance service “works tirelessly” to provide safe and efficient emergency care and transport. “Everyone in Northern Ireland, no matter where they live, should have access to a reliable emergency ambulance service when they need it,” the Minister said. We analysed over 236,200 emergency Category A and B incidents attended by the Northern Ireland Ambulance Service (NIAS) during 2012 and 2013. Category B incidents are those where a patient’s condition is serious but not life threatening. The recorded response times are based on the arrival of either an ambulance or rapid response vehicle (RRV) at the scene. The map above gives a breakdown of the Category A responses for the last two years in each postcode area of Northern Ireland – including the number of incidents and longest wait recorded. Within the Belfast health trust area, 82% of Category A calls received a response within 8 minutes, compared to only 61% of the calls based in the Northern trust area. 69% of all Category A calls (68,149) were responded to in less than 8 minutes. This is down from 71% for the two year period 2011-12. The longest wait for a Category A patient was four hours 23 minutes for an ambulance to arrive for someone with chest pain in March 2013. The postcode district was BT17 which covers Belfast, Derriaghy, Dunmurry, Hannahstown. Heavy snow storms in Northern Ireland at this time may have impacted on the crew’s response. Of the 1,492 Category A incidents attended in BT74 (Enniskillen town, Boho, Fermanagh), 92% were responded to in less than 8 minutes. This compares to none of the 27 call outs to BT68 (Caledon, Minterburn, Dungannon and South Tyrone) and less than 1% (one call out) of the 125 incidents in recorded in BT76 (Clogher, Dungannon and South Tyrone). We spent an afternoon with a Belfast-based ambulance crew to experience the pressures of the job at first hand. A video of this is also available within our coverage today. As well as the stress of dealing with life and death situations on a daily basis, the NIAS has also confirmed that 275 verbal and physical assaults on crews were recorded during the 2013/14 financial year. We last examined Northern Ireland ambulance response time data for 2010 and 2011 for a report we published in 2012 – see here. In response to our latest findings, NIAS chief executive Liam McIvor said: “In an environment of constrained financial resources where demand continues to rise and the ambulance service continues to respond to all calls as quickly as possible, timeliness of response will suffer as demonstrated in the data presented. Mr McIvor paid tribute to the “commitment and dedication” of the ambulance personnel in Northern Ireland. Using Freedom of Information legislation, we submitted a request to the NI Ambulance Service for detailed information on each of the 236,256 Category A and B call outs during 2012 and 2013. For each incident the NIAS provided us with the time it took for an ambulance or rapid response vehicle (RRV) to arrive, the postcode district, the chief complaint/symptom, the month and year the call was made, where the call came from and which health trust the emergency call originated from. Out of all of the emergency 999 calls, 35% were made from a telephone, 31% from a mobile phone, 8% from a doctor, 8% from police control and 5% from hospitals. The remaining emergency calls included out of hours hospital services, the fire service, midwives, coastguard, airports and consultants. We gave the ambulance service the opportunity to comment on some of the longest call outs we identified in the data we received. Instead the service choose to provide us with a general comment which it said would contextualise the figures rather than provide individual explanations for each of the cases we raised with them. Of all the category A and B calls, the ambulance service recorded a response time of zero minutes for 2,101 incidents. The NIAS said can happen because the performance time for an ambulance is only recorded from the point when the location and chief complaint information has been received from the emergency caller. Before this point, an ambulance may already have been allocated and on its way. The NIAS also warned that “minor data errors may also be evident with the information provided due to the volume of records sourced”. Among the incidents were 88 incidents based in the Republic of Ireland – 34 Category A and 54 Category B. Within the Category A incidents were patients with breathing problems, traffic incidents, falls, cardiac issues, convulsions/fitting and pregnancy/childbirth/miscarriage. The NIAS said that, from April 2013, the Health and Social Care Board and ambulance service should ensure an average of 72.5% of Category A (life-threatening) calls are responded to within 8 minutes (and not less than 65% in any Local Commissioning Group area). The ambulance service responded to 99,343 Category A calls in 2012 and 2013 with 69% (68,149) responded to in less than 8 minutes. An ambulance took an hour or longer to arrive at the scene of 34 Category A – see table below. These cases include “traumatic injuries”, "stab/ gunshot/ penetrating trauma” and people suffering from breathing problems, chest pains and overdose/poisoning. Of all the Category A calls – the largest number of call outs were for chest pain (non-traumatic). This was 17,807 (18%) of all emergency Category A calls responded to. This was followed by 15,546 incidents involving casualties with breathing problems (16%), 13,576 (14%) unconscious/fainting, 12,678 (13%) emergency transfers and 8,018 (8%) convulsions/fitting. Other incidents included falls, strokes, burns, animal bites/attacks and choking. One call out in April 2012 was categorised as “stab/gunshot/penetrating trauma’ – it took an hour and one minute for the ambulance crew to arrive at this incident in BT46. This district covers the areas of Maghera, Lisnamuck, Swatragh, Upperlands, Magherafelt. Three of the four longest call outs were in March 2013 – ranging from one hour 29 minutes to four hours 23 minutes. It may be that heavy snow during this month impacted on these responses. In BT30, there was a wait of an hour and 39 minutes for an ambulance for someone who suffered an assault/sexual assault in March 2013. This postcode includes Downpatrick, Ardglass, Crossgar, Killyleagh, Loughinisland and Strangford. Compared to 2011-12, the percentage of calls responded to in less than 8 minutes has gone down in 52 of the 80 Northern Ireland postcode districts, stayed the same in 10 areas and increased in 18 districts by between 1% and 7%. The area with the largest number of life-threatening call outs for ambulance staff was BT48 in Derry (Cityside, Ballynagard, Coshquin, Rosemount, The Collon, Culmore). In this postcode district there were 4,251 Category A incidents during 2012 and 2013 – 3,344 (79%) were responded to in less than 8 minutes. The longest wait for an ambulance in the cardiac cases was one hour 11 minutes in January 2012 in BT47 in Derry (Waterside, Claudy, Feeny, Dungiven, Eglinton, Park and New Buildings). This was followed by a 56 minute wait in September 2013 in BT46 (Maghera, Lisnamuck, Swatragh, Upperlands and Magherafelt). Category B calls are serious but not life threatening. The NIAS responded to 136,913 Category B incidents in 2012 and 2013. The NIAS target is that patients with serious but not life-threatening conditions should receive a response within 21 minutes of the request for transport being made in 95% of cases. There were 136,913 Category B call outs in total in 2012-13. Of these, 123,723 were responded to within the target of 21 minutes or less – 90%. Again, this is a drop from 93% in 2010/11. A total of 361 Category B calls took an hour or longer to respond to. These included traumatic injuries, overdose/poisoning, breathing problems, falls, convulsion/fitting and someone thought to be having a stroke. The two longest category B call outs related to assaults/sexual assaults and both were in December 2013. An ambulance took 3 hours 33 minutes to reach one patient in BT11 (Andersonstown in Belfast). In the second case an ambulance took 3 hours 16 minutes to reach a casualty in Belfast city centre (BT1) following an emergency call from police control. It took 2 hours 56 minutes to reach a patient logged with ‘overdose/poisoning’ in BT33 (Newcastle, Bryansford, Dundrum and Down) in December 2013. Of the 19 emergencies which took longer than two hours to respond to – 10 were in December 2013. The 19 incidents included incidents of traumatic injuries, stroke, overdose/poisoning and ‘psych/abnormal behaviour/suicide attempt’. 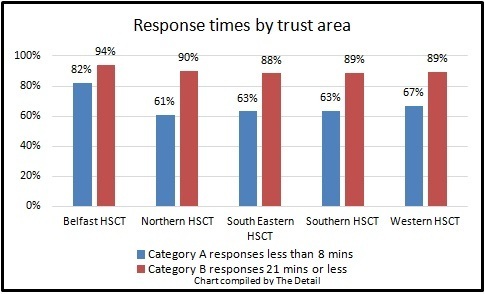 There were difference within health trust areas in relation to response times to both Category A and B incidents. A stroke happens when the blood supply to part of the brain is cut off. It is a serious medical emergency which needs urgent treatment. The Stroke Association states that a speedy response to a stroke can help reduce the damage to a person’s brain and improve their chances of a full recovery. A delay in getting help can result in death or long-term disabilities. Of all the Category A and B emergency call outs in 2012/13 7,103 were patients thought to be suffering from a stroke. Almost 62% (4,371) were prioritised as Category A life-threatening emergencies. The remaining 2,732 were categorised by control centre staff as less serious Category B incidents. In March 2013 – when Northern Ireland was affected by heavy snow – it took a crew three hours 9 minutes to reach someone in BT17 thought to be suffering from a stroke. This 999 call came from police control and was classed as Category B. This postcode district covers Belfast, Derriaghy, Dunmurry and Hannahstown. The second longest response time for a Category B stroke was 52 minutes to get to a patient in BT35 in April 2013. This is the area of Jerrettspass, Bessbrook, Camlough, Crossmaglen, Belleek, Newtownhamilton, Newry and Mourne. Of the 4,371 stroke emergency calls in Category A, the longest time it took to reach a patient was 57 minutes. This was in February 2013 and the ambulance was called to BT13 in Belfast – Shankill Road, Woodvale, Ballygomartin, Springmartin, Glencairn and Highfield. In 43 of the Category A stroke cases the ambulance took half an hour or more to arrive and 257 took 20 minutes or more to arrive. Looking at both Category A and B, 90 stroke patients had to wait half an hour or more for an ambulance. Of the 4,371 Category A stroke calls over the two year period, an ambulance arrived in 2,679 cases (61%) in less than 8 minutes. We asked the NIAS to explain why a stroke would ever be categorised in Category B when a fast medical response is so crucial to save lives and also reduce long term brain damage. A spokesman said: “Category A is reserved for those calls where the patient’s condition is judged immediately life threatening – for example a patient who is unconscious or not breathing or having difficulty breathing. “Not all patients with an acute stroke exhibit these symptoms and therefore a category B response is appropriate. “Category B are still responded to as blue light emergencies by nearest available resource. Andrew Dougal, chief executive of Northern Ireland Chest, Heart & Stroke, said that the NI Ambulance Service has achieved very high standards in getting people to hospital in time for a scan and clot-busting drugs after a stroke. He said: “It is essential that individuals are brought to the hospital as quickly as possible in order to administer the clot-busting drug for stroke. “This can only be done within a timeframe of three hours. This includes the time from the onset of stroke to the administration of the drug. “In that intervening period the ambulance must get to the patient and bring the patient to hospital. Mr Dougal said that two incidents have been reported where there was delay. A GP intervened by telephone to redirect one ambulance to a hospital which could administer the important clot-busting drug to a stroke patient. In the second case a patient in the Lisburn area was collected by an ambulance crew but then diverted to deal with an asthma attack at another person’s home. He added that members of the public have a critical role to play when it comes to treatment for heart attacks and strokes, including people trained in first aid. Following our analysis, we sent a detailed email to the NI Ambulance Service which included asking for a comment on some of the longest waits for an ambulance. The ambulance service instead sent a four page response from NIAS chief executive Liam McIvor which addressed many of the issues we had raised. To read the full response, click here. Mr McIvor said: “The Northern Ireland Ambulance Service welcomes the opportunity to set the context for the information that you present and hope that it will engage the public of Northern Ireland in a debate on the use of their ambulance service and the investment necessary to deliver their expectations. “The challenge is to respond to all calls as quickly as possible. “Our systems are designed to support this goal by triaging calls to distinguish and prioritising response to life threatening over non life threatening emergency calls. “In an environment of constrained financial resources where demand continues to rise and the ambulance service continues to respond to all calls as quickly as possible, timeliness of response will suffer as demonstrated in the data presented. “We continue to highlight the financial constraints within which we operate – we spend less than ten pence per person per day on our ambulance service in Northern Ireland. Investment in ambulance services in Northern Ireland is less than £35 annually per person, which is one of the lowest in the UK. While paying tribute to the “commitment and dedication” of the ambulance personnel, Mr McIvor noted the drop in response times. He said: “The speed of response is a key measure of performance for any organisation, particularly so for an emergency ambulance service and we acknowledge our inability to maintain the performance achieved in 2011/12. “We are getting to more patients more quickly than ever before, but increasing demand for emergency response has impacted heavily on our capacity to respond promptly. We averaged a sub 8 minute response to these life threatening calls in 68.3% of cases throughout Northern Ireland in 2012/13. “Looking ahead it is clear that 2014/15 and beyond offers no indication of respite from the challenges we face, particularly increasing demand, rising expectations, and less funding. “As we look to this future we recognise the necessity to address immediate pressures and challenges such as Category A response, ambulance turnaround at hospital, staff issues around meal break management and grading resolution, achieving financial balance with sound procurement processes and prompt payment. In April a new report was published by the Nuffield Trust and the Health Foundation which compared healthcare systems across the UK before and after devolution. Speaking then, Health Minister Edwin Poots said this report reflected “noticeable improvements” in ambulance response times in Northern Ireland. However, this research only examined data here up to the 2011/12 year. It said that ambulance performance (percentage of Category A calls responded to within 8 minutes) had increased to 73% in 2011/12 from 50% in 2004/5. Our study today covers the call outs attended during the full 2012 and 2013 calendar years. New figures released today by the Department of Health show that the percentage of Category A calls responded to within 8 minutes during the 2013/14 financial year dropped further to 67%. We asked Mr Poots to comment on our findings, what he thinks of people waiting more than an hour for an ambulance and we also questioned if the department invests enough money in the ambulance service. We also asked the Minister if it is acceptable for incidents involving people thought to be suffering from strokes to be categorised as a Category B incident and whether this goes against the public campaign for FAST action to reduce deaths and disability following a stroke. He replied: “I am disappointed that the Category A ambulance response times has dropped, as I know that the Northern Ireland Ambulance Service works tirelessly to provide safe and efficient emergency care and transport. “Everyone in Northern Ireland, no matter where they live, should have access to a reliable emergency ambulance service when they need it. The Minister said that he knows the Ambulance Service is working very hard to meet these targets, and that it must be acknowledged that, at times, the rural nature of locations and adverse weather can have “an unavoidable impact upon response times”. He continued: “For the period between 2008 and 2018, almost £100m is being invested in improving the ambulance fleet, providing additional Rapid response Vehicles (RRVs), which arrive ahead of an emergency ambulance to ensure that a person is treated as quickly as possible, additional deployment points, new SatNav systems, and a new Regional Emergency Medical Dispatch Centre whose doctors triage each call. “These medical professionals make a decision on where RRVs and ambulances are to be sent so that the most appropriate care is sent to each incident. I am not in a position to second guess that medical decision; I simply know that they aim to provide the best possible care to each and every caller.